KIEV, Ukraine -- As the Ukrainian presidential election scheduled on May 25 gets closer, Kremlin's window of opportunity for invading the country and derailing its European course is gradually narrowing. The rhetoric of Russian President Vladimir Putin justifying the Anschluss of Crimea and unscrupulous meddling in Ukraine's internal affairs has been based on the premises that there is no legitimate government in Kiev, that it is being run by a gang of Nazis and anti-Semites who took power by coup d'etat and terrorised Russians and Russophones all over the country. Such a claim, however calumnious and fully disproved on the ground by independent observers, opinion polls and the minorities themselves, can be sold nonetheless to some audiences, at least Russian, willing for various reasons to be fooled. After May 25, when the presidential elections will happen, the propagandistic task would become much tougher. Neither Yulia Tymoshenko nor Petro Poroshenko - the frontrunners of the current presidential campaign - resemble anything close to the proverbial "nationalists", "extremists" and "Russophobes". In fact, both have actually been and remain primarily Russian-speaking in their life, even though, as most citizens of Ukraine, they have good command of Ukrainian as well. The alleged "far-right" candidates - the heavily demonised Dmytro Yarosh of the Right Sector and Oleh Tiahnybok of the Svoboda Party - fall far behind in opinion polls and will likely barely be able to muster more than two to three per cent support. This is how the myth of the "fascists" drawing Ukraine into a civil war may fade, unless of course the civil war is instigated from abroad. The Kremlin is acting quickly before the new Ukrainian regime gets consolidated. Currently 40,000 troops standing at the Russian border and thousands of militia storming local administration buildings in Kharkiv, Luhansk and Donetsk are putting strong pressure on the Ukrainian government. The Ukrainian authorities are cornered in a lose-lose situation. They are tempted to use force against the attackers, but must also be careful not to give an excuse for a Russian intervention. Currently there are three possible scenarios that endanger Ukraine's sovereignty. First, attempts to appease the separatist may result in a complete collapse of the Ukrainian authority over the eastern regions and the emergence of a puppet pro-Russian state similar to Moldovan Transnistria. It will likewise exist in legal limbo without international recognition. Second, the eastern region may decide to proclaim itself the "true Ukraine" and, with Russian backing, launch an offensive against the central government in Kiev to re-establish Viktor Yanukovych's "legitimate" presidency. The scenario is barely new since it was fully employed in 1918 when the Bolsheviks created a puppet "Ukrainian" government in Kharkiv to overthrow the democratic government of the Ukrainian National Republic (1918-1920) in Kiev. The main advantage of the scenario is to disguise a Russian-Ukrainian war as a Ukrainian-Ukrainian war. The third option the Ukrainian government faces today is to submit to Russian pressure and bullying and accept a broad range of Kremlin-designed constitutional and administrative changes. These would transform Ukraine into a loose confederation of weak states highly vulnerable to Russian subversion, manipulation and sabotage. The next six weeks until May 25 elections will be decisive for Ukraine's future. This is the time when Kiev should receive support from the West and establish control over the eastern regions because the Russian threat will not go away with Crimea. In fact, Moscow's anti-Ukrainian rhetoric, which feeds eastern separatists ideas, continues to operate efficiently. The Russian anti-Ukrainian propaganda has been thoughtfully elaborated within the past ten years and transformed into a full-fledged information war since November 2013 to acquire the Russian population's support for action against Ukraine. Three major narratives emerged that can be summed up as "Ukraine's borders are artificial", "Ukraine's society is deeply divided", and "Ukrainian institutions are irreparably dysfunctional". To put it simply, Ukraine is a failed state ("not a country", as Putin reportedly told George W Bush at the 2008 NATO summit in Bucharest), and it, therefore, needs external, apparently Russian, guardianship. On one hand, Russian propaganda had very strong "anti-fascist" and "minority-protection" rhetoric. On the other hand, it exploited traditional - both Soviet and pre-Soviet - anti-Ukrainian stereotypes that divided Ukrainians into a loyal majority of "Little Russians" (a dull but harmless provincial branch of Great Russians) and the perverse minority of "nationalists" (arguably corrupted by Western influence and therefore obsessed with a crazy idea of Ukraine's difference and separateness). Such an imperial legacy makes Russians highly susceptible to anti-Ukrainian propaganda that works especially well today, in the increasingly homogenised media environment where unsuitable facts are silenced, alternative sources of information are blocked or marginalised, and any alternative is deemed deviation, obsession, extremism, and national betrayal. As a result, as many as 56 percent of Russian respondents believe that Ukrainians and Russians are a single nation; 83 percent believe that there was coup d'etat in Ukraine in February, 77 percent blame Ukrainian leadership for the deterioration of relations between Russia and Ukraine; only 7 percent disapprove the annexation of Crimea. Only 13 percent recognise that the main reason for the negative Western reaction is Russia's violation of international law - all the others ascribe it to either misunderstanding of the real situation in Ukraine (20 percent) or intrinsic hostility of the foreigners toward Russia (58 percent). Remarkably, many more Russians trust in state media (62 percent) than independent media (16 percent); 54% agree that "there are important social issues and topics about which it is permissible to distort information in the public interest"; and 72 percent agree that "there are important social issues and topics about which it is acceptable to remain silent in the public interest". With such popular attitudes and firmly controlled media, the Kremlin does not find it hard to sell any information it wishes to the larger population. The lack of alternative views not only in the society at large but also within the ruling elite does not bode well for Russia. Its leadership is trapped in the virtual propagandistic world it created and is completely dependent on its logic. Propaganda, as Timothy Snyder, a Yale professor of history, notes, is not "an edited version of reality, but rather a crucial part of the endeavour to create a different reality (…) not a flawed description, but a script for action. If we consider Putin's propaganda in these Soviet terms, we see that the invasion of Crimea was not a reaction to an actual threat, but rather an attempt to activate a threat so that violence would erupt that would change the world. Propaganda is part of the action it is meant to justify". The Russian elite, infected by its own propaganda, becomes increasingly paranoid and determined to fight the invented "fascists" in neighbouring countries as if they are real. This means that whatever Ukraine does or says in this regard, it matters little. The real choice is either to share the fate of the 1956 Hungary and 1968 Czechoslovakia invasions by the Red army or to follow the example of the 1920 Poland and 1940 Finland (when the Russians were contained). 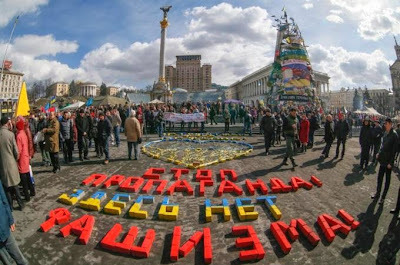 Ukrainians should learn to live for years, perhaps for decades, not only under persistent political and economic pressure but also under blatant propagandistic war, prone at any moment to turn into quite a real military invasion. If it does not happen by May 25, it may well happen eventually, albeit under some different pretexts and slightly modified rhetorical wrapping. No government in Kiev will be recognised by Kremlin as legitimate until and unless it is the Kremlin's government. Russia wants to force Ukraine to give in. They took Crimea beacause it was easy. They are pushing the eastern cities. If Ukraine does not respond. They will move in saying it is to protect the Russian ethnic people. If they do respond. It has to be swift and not protracted. If protracted Russia will use it to the advantage. Regarding ethnic Russians. Russia gave Crimea to Ukraine in 1957. Technically those born before 1957 could be considered Russian. Anyone born from 1957 on would be Ukrainian. I have friends all in Ukraine. Everyone speaks Russian. The actual number of people who speak Ukrainian is the smaller. Most speak both languages. You almost have to if you want to communicate there. Putin's lies are so thin as to be invisible. I have a hard time believing anyone would truely not see through them. If Russia was so eager to help. Why did it have to be Russia or the EU? If Russia is so concerned about Ukraine and its people. Why didn't they say. 'Go ahead. Do the deal with the EU. We will also lend you money. If the deal is a good one. And it will help go ahead. However, if it things do not work out. Here we are.' Russia and the EU could have supported Ukraine. No protests. No change in government. No loss of Crimea. But if Russia and the EU both do business with Ukraine. A big spotlight gets put on the Ukrainian governemnt and Russia. Russia loses it's control of Ukraine. Most of Ukraine's exports go to Russia. Supposedly businesses there believe they can not trade directly with Europe. Maybe so. But if outside business comes in. If money is available to make upgrades to equipment. Who knows. I have a running bet with some friends. $100 if they can prove me wrong. That Russia has been importing Ukrainian goods for years. Repackaging them with Russian labels. And selling to the rest of the world. Why? Cheaper than to make it in Russia. Moscow is the most or atleast one of the most expensive cities in the world. So is the country. Anything actually produced there costs more. In Ukraine where the economy is poor. The government controlled by Moscow. It's like US companies farming production out to Taiwan. Except in this case no one knows. The only see the label. Did you know most western Russian people. The ones living in smaller cities along the border. Do their major shopping in Ukraine? In a city like Kharkiv. Why? Because the cost in Russia for the same goods. It's so much higher. It is easier and cheaper to cross the border into Ukraine. Buy the goods necessary and easier to get in Ukraine. Pay less for them and drive home. Like us going to Costco. More for less. Russia is waiting for an excuse to go into Ukraine. I say let them have Crimea. NATO needs to back up the Ukrainian military. The EU and IMF need to step up. Along with other countries and support Ukraine. Ukraine needs to tell Moscow off. Then shut down the pipeline going through. Europe says it will help Ukraine. So back flow the natural gas to Ukraine. Russia will feel the pinch. Also openly express on every TV, radio and newspaper. That any citizen in Ukraine, Russian speaking or not. Is an individual. And as such can participate in the government and elections. Ukraine needs to pull up its big boy pants. Step up and not worry about what it may have lost. But what it has to lose. Moscow is going to cross the border. They are going to move. The meeting happening soon. It is another show by Russia. Supposedly to help the situation. But in reality they are going to throw their weight around. And make demands. If the EU, US or Ukraine gives in. The country is lost. It is just my oppinion of what I have seen. What I have heard. What I know from friends I talk to on both sides of the border. Also, if Ukraine goes. What is to stop Russia from other countries it wants to reaquire? They can use the same destablilizing tactics and here we go again. Do we really want to look up. See another country in this situation. Be reminded of what we should have done. Not what we did. Thanks for the opportunity to stand on the soapbox.